I started thinking about this story nearly ten years ago. 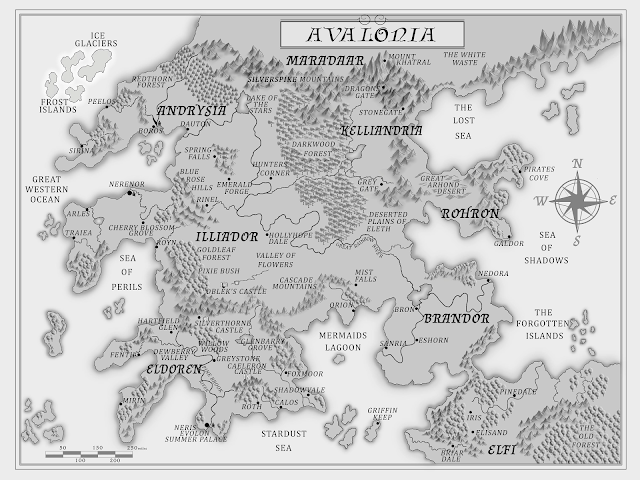 Building the world of Avalonia, whenever I got time. It was all a hobby at first. I didn't really think I'd ever publish this Book when I started imagining Avalonia. Initially, I just created the world. I enjoyed drawing maps, and Writing down the history and culture of each kingdom, creating different societies and cultures, and it just kept growing and growing. Soon characters started popping up all over the place, each one with their own backstory, history and family. One of the first scenes that I thought of in Avalonia was in a Magical fairy market. And the first character that came to my mind was Mrs. Plumpleberry, Kalen’s mother. But it was only when I stood before an old French tapestry in my grandmother’s house that I realized the magical market could easily be in the forest depicted in the tapestry. That’s when the whole story started taking shape. And so the world of Avalonia sprang into existence. One day I stood before it and wondered, what if I could step into the tapestry, where would I end up? From then on, the person who stepped into the tapestry was a young 16-year-old girl who didn’t know who she really was, her name was Aurora, and this is her story. That is when I realized without a shadow of a doubt that this is what I wanted to do. To tell stories about magical worlds and the people who live in them. Inspiration comes from many different places, and there is never one particular thing that has influenced me to be a writer. In fact it is more of an amalgamation of a variety of different thoughts and concepts accumulated over the years of being an avid reader. For me, the whole concept of stepping into another world through a magical gateway has always been the basis of my inspiration to write fantasy literature for young adults. My love for fantasy literature stemmed from one of the first books I ever read on my own, Enid Blyton's Magic Faraway Tree series. Since then I was hooked and proceeded to devour anything fantastical that came my way. From the magical worlds of C. S. Lewis' The Chronicles of Narnia series, to T. H. White’s The Once and Future King and Tolkien's Lord of the Rings series. Books with an element of fantasy and magic have always fascinated me and influenced the way I look at literature today. J. K. Rowling’s Harry Potter series, Roald Dahl’s Charlie and the Chocolate Factory, Diana Wynne Jones’ magical worlds, Lewis Caroll’s Wonderland books, Ursula le Guin’s Earthsea Quartet and J.M Barrie’s Peter Pan, have all in some way contributed towards my love for magical adventures and fantasy worlds inspiring me to write fantasy for young people. There are many others that have influenced my writing in this genre. David Eddings' The Belgariad series and Terry Brooks’ The Sword of Shannara books made me realize the true extent and scope of epic fantasy. Tamora Pierce's Song of the Lioness Quartet and Robin Mckinley’s The Hero and the Crown, were very instrumental in the creation of my main character Aurora. They made me better understand what fantasy looks like with a young girl as the hero. These books inspired me to write a story that would combine the best of all I had learned from these wonderful stories, and so The Last of the Firedrakes started to take shape. What kind of research goes into your book? There is actually a lot of research and hard work that goes into writing a story of this scale. After all, it is 488 pages and this is only the first book in the series. The creation of the world itself took me years. From detailed maps to notebooks filled with information on all the different kingdoms, their politics, societies, trade routes, race, cultures, etc. Each character has a backstory and a whole history including character traits, their likes, dislikes, family connections, physical descriptions, and more are all drawn out. In addition to all this, there is mapping out of the magic system used in this world. Everything has to make sense. Book two of The Avalonia Chronicles! One of the main concepts of the story is that Aurora could be anyone; that at any point of time it could be you who could open a cupboard, enter a library, or step into a tapestry and be transported to a magical world. So when I saw the tapestry in my Grandmother’s house one day, it just clicked that this could be the gateway to Avalonia, and so Aurora Darlington/Firedrake came to life in my head. I wanted my main character to be one whom young teenage girls could relate to. But at the same time I wanted her to be strong-willed, capable and someone whom they could look up to as well. Aurora is sixteen years old; she’s an ordinary girl living an ordinary life. But when she is thrust into a magical world unprepared, that’s when her character starts her journey of discovery. It is not only a journey of learning about the world of Avalonia and its many societies, cultures, and magic. It is also an inner journey for Aurora, a journey of life. In essence this is a coming of age story, and revolves around a time in Aurora’s life when she has to learn to grow up and face life’s responsibilities on her own. She's very naive in the first book and she is brave and curious too, not always the best combination. She ends up making mistakes and gets into trouble just like a regular teenager would. It is only in book two that we will get to see the change in her character. It is a gradual process, and takes time but she will eventually adapt to her situation and grow up in the process, becoming the warrior queen she was always destined to be. I think I would have to say that it is the actual world building that fascinates me the most. Creating the world in which my characters live takes up a lot of my time. I love doing research on different ages, histories, mythologies and legends. Researching medieval castles and warfare is one of my favorite pastimes. Once the world is built and the characters have been created, only then will I start writing. That is when everything comes to life; it’s like a movie playing in my head. I can imagine each scene and place as if I have been there; the world becomes a real place to me, as do the characters that live within. It is the most creative and interesting part of my writing process. I enjoy making sure my characters adhere to the rules and constructs of my world, including the restrictions and use of magic, and the story starts taking shape from there. Do you know the ending of your books before you finish writing them? One thing I’ve learned through this whole saga of trying to get my first book published is, never send your manuscript out to agents or publishers until it’s absolutely ready. I would also advise working with an experienced editor in your genre to polish the manuscript before you send it to anyone. For those of you who want input on your writing or just want people to read what you’ve written to gauge their response to your work, then Wattpad is a wonderful way to reach many readers and interact with them while they read your book. It is a great platform to meet other aspiring authors, make friends who love the same books and get your book noticed. Many authors have gone on to get agents or major publishing deals after their books did really well on Wattpad. But the most important thing to remember is to always keep on writing. Even if you never intend to use that chapter, just get the words on the page. When she was pregnant with her first child ten years ago, a story popped into her head she could not ignore. “I was at my grandmother’s house, and as I looked at the image of a beautiful forest with a castle in the distance on a tapestry hanging on the wall, I imagined myself being whisked away into another world,” she said. It was at that moment the world of Avalonia, with its powerful mages and fae and the evil Queen Morgana, was born. 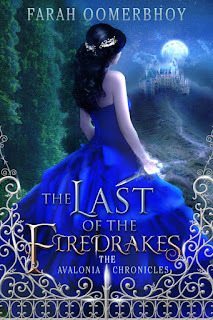 Farah Oomerbhoy’s debut novel, The Last of the Firedrakes, was released in the summer of 2015.